About a year ago, Roku launched The Roku Channel, which is an ad-support collection of movies, TV shows, and live news that is available for free on Roku devices. The channel has been quite popular, so Roku made it available on the web a month ago. In doing so, they’ve inadvertently also made it available to all Amazon Fire TV devices thanks to the Silk Browser. The web interface for The Roku Channel works so well through the Silk Browser that I’ve released a Bookmarker app for The Roku Channel, to make accessing it through Fire TV devices that much easier. To load The Roku Channel on a Fire TV device, you can either enter therokuchannel.roku.com manually into the Silk Browser or install my free Bookmarker for The Roku Channel app to get one-click access from the Fire TV home screen. The first time you load the page, you’ll need to allow protected content playback from a popup that appears. You’ll then be able to freely browse the available content. Navigating the content library through the Fire TV isn’t as efficient as on a Roku device because you’ll need to make selections and scroll by moving around the Silk Browser’s pointing cursor. While it’s not ideal, it works surprisingly well and just takes a little getting used to. Once you select to play something, you’ll be asked to log in with a Roku account. The accounts are free and do not require any kind of payment method, since all of the content is also free. If you don’t already have a Roku account, you’ll probably want to create it through a PC or phone, since it can get tedious to do so using the Fire TV remote. After you log in, all content will be available to stream. Once a video is playing, the Play, Fast-Forward, and Rewind buttons on the Fire TV remote work perfectly to control media playback in The Roku Channel. You can even use Alexa voice commands to pause and play the video, thanks to Silk’s recently added support for Alexa. To jump far ahead or back, you’ll need to position the cursor on the progress bar, but that works as well. It likely was not Roku’s intention to make their free content available through competing streaming devices like the Amazon Fire TV, but that’s what they’ve done by releasing a website for the channel, since the Fire TV has a full-fledged web browser. I wouldn’t be surprised if Roku eventually ends up blocking access through Silk for the Fire TV, so enjoy it while it lasts. Of course Roku is still making their scratch with ads, but you are right on, something tells me their intention was strictly for users of their own platform. I’m curious if they will switch to some form of device verification to log in, I mean they can’t just take it away now for their subscribers. I have an old Roku account, I’ll check this out. Roku doesn’t care where you watch because they get ad revenue either way, and their intention is to release the Roku Channel on more platforms. It’s alresdy available on Samsung TVs as well. It must have been something Roku fixed on their end. When Roku Channel first launched online, you could log in but you couldn’t play any videos. I doubt Roku cares where you watch it from as long as they get to serve ads. Which is smart. The more people that can access it, the more ads they can serve and the more they can get their brand name out there. This does not work on my Elementary Fire tv. Says unsupported browser. It works on my Element Fire TV Edition television. 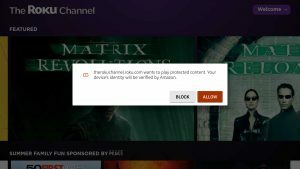 Did you select “allow” when The Roku Channel site first loaded when it asked to allow protected content? If you didn’t select “allow” it will say the browser is unsupported. You’ll need to clear the data of the Silk Browser to get the message to appear again. Or you can just uninstall Silk and then reinstall it. That must have been it, because it says unsupported browser link. I’ll try what you said, Thanks! The Bookmarker for The Roku Channel app isn’t compatible with my first generation fire TV stick. Bummer. made an account and got signed in. made an account couple weeks back when trying this on the Firetv and it would not let me login, kept saying my acount did not exist, yet i could sign in on the laptop just fine. so now i got signed in and tried playing a movie and all seemed well until 30 seconds in. was able to skip around and the movie plays but that error comes up and interrupts playback. Is it just me or does this not play in HD? Picture quality is pretty bad through Silk? Amazon has lent credence to all the things Roku fanboys have warned about for years. AFTV devices are designed to sell Amazon content. Amazon has firewalled streaming services and apps, OTA, and anything they do not make money off. I can’t seem to download the app. It says Free Download but when I mouse over it it doesn’t change to a hyperlink. So no way to download on Amazon Appstore. Same here. It does not work. Tried on pc, android phone and ftv stick 2. Any advice? So if I’ve been using the Roku up til now, but just got a FIRE TV, my Roku is now redundant? This does not work… you can get to roku channel on silk browser, but when you try to play something it says – no license server URL specified. Well, i can get to the Roku sign in screen and fill all blanks but to prove i’m not a robot box will not check with the firestik remote, tired of it now..Suggestions?